Automobile and modification from a young mind! The latest example to catch our eye is the Flying-Cam III E Special Aerial Response Autonomous Helicopter (SARAH) – a fully electric quasi-UAV camera platform for getting those majestic soaring shots for film and television shoots. 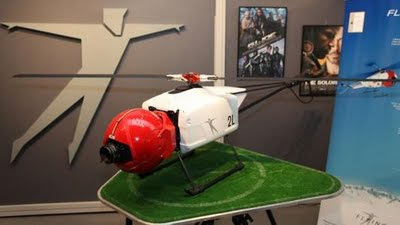 As a company, FLYING-CAM has been developing UAV helicopters tailored to close range aerial filming for more than 20 years – Eragon, Van Helsing, Mission Impossible II, Hancock and GI Joe: Rise of the Cobra are just a few of the movies to utilize a Flying-Cam for aerial shots. But it has only recently turned its expertise to an electric version with an autopilot system. Although the Flying Cam III isn’t fully autonomous, it does include features that make operation of the craft easier. These include the ability to pre-program a flightpath thanks to a high-end Attitude and Heading Reference System (AHRS), Differential Global Positioning System (DGPS) precision navigation and proprietary Computer Assisted Piloting (CAP) autopilot system. Its helicopter-based design gives it Vertical Takeoff and Landing (VTOL) capabilities, while its modular design platform is designed to ensure the Flying-Cam III can carry a variety of payloads. In its standard configuration it weighs 25 kg and includes a stabilized day or night camera sensor and Coded Orthogonal Frequency-Division Multiplexing (COFDM) HD video transmission. The Flying-Cam III E SARAH was released at the Paris Motor Show, but Gizmag spied it at IBC 2009 in Amsterdam. Any budding Spielbergs can contact FLYING-CAM for information about how they can get some awe-inspiring aerial shots into their next blockbuster. Thank you for your comment. Please, share this article in your social networks.